In Martha’s Children, Martha and her fellow vampires end up in a war with the Chicago cops when they come to that city for the 1968 Democratic National Convention. Their experience resembles that of many of the people who came to Chicago that summer. For Chicago was a city at war, hosting a political party torn apart by a war. It wasn’t supposed to be that way. At the beginning of 1968, Chicago and the Democrats were sitting pretty. 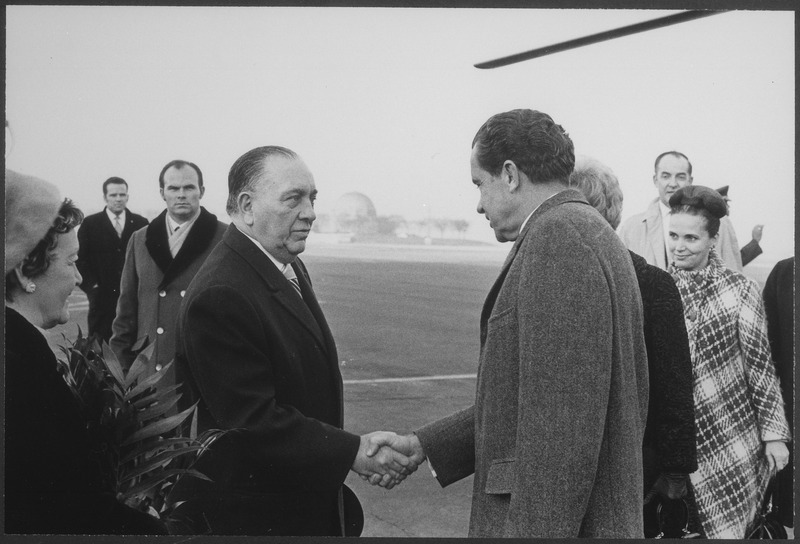 Mayor Richard Daley and his Democratic political machine ran the city, and were looking forward to hosting a political convention, at which Daley expected to play a role befitting a man of his political stature. And the Democrats, firmly in control of Congress, expected to rubber stamp the renomination of President Lyndon Baines Johnson for another term, and cruise to victory in November. Good times all around. But LBJ was engaged in a two-front political war. In those days, the conservative Democrats dominated the Old South, while moderate and liberal Democrats won the support of labor unions and cities in the North. 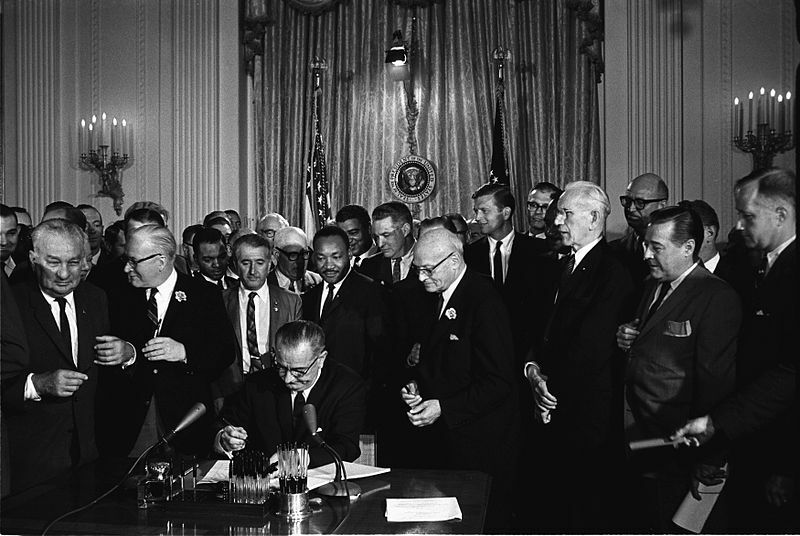 Though a Texan himself, LBJ had pushed through major civil rights legislation, alienating the segregation-minded Southerners. And his escalation of the Vietnam War had aligned some liberals against him. The enemy’s Tet Offensive in January, 1968 discredited the Administration’s claim that the United States was winning in Vietnam. On March 12, Eugene McCarthy, running as a peace candidate, won 42% of the vote in the Democratic primary in New Hampshire. Robert “Bobby” Kennedy, brother to the President assassinated in 1963, entered the race also as a peace candidate a few days later. Realizing he could not succeed as President and hold his party together, LBJ announced his withdrawal from the race on March 31. The Democratic party split three ways, with Kennedy and McCarthy squabbling over who would lead the left, George Wallace advancing as the segregationist candidate of the right, and LBJ’s Vice President, Hubert Humphrey, historically a party liberal, fighting to hold the party machinery and center together. The assassination of Martin Luther King, Jr., the powerful black spokesman for peaceful integration, on April 4, dashed black hopes and led to riots in most major cities, including Chicago. Mayor Daley called in the National Guard to help his police crush the riots, even telling them to “shoot to kill” suspected arsonists and looters. (There was a lot of argument after the fact whether Daley had given such an order. But it reflects his general attitude.) And then just as he had won the California primary and was about to unify the peace wing of the party, Bobby Kennedy was assassinated on June 5. The left wing of the party fell into chaos, feeling it had been cheated of a chance to win the nomination. Finally, to top off the witch’s brew, the Yippies, a radical political movement whose name was a play on the term “hippie,” decided to hold their political convention, at which they nominated a pig for President, in Chicago at the same time as the Democratic convention. 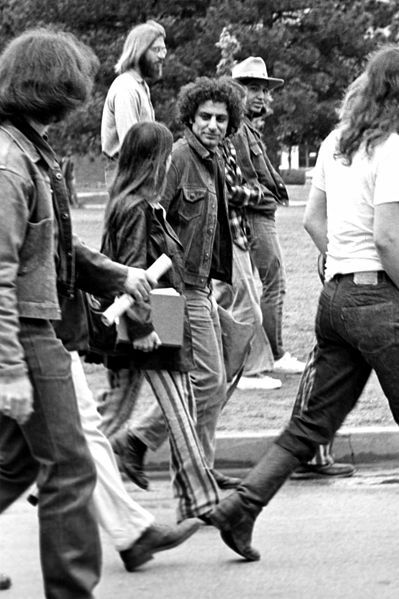 Several other radical movements decided to show up in force as well, many to protest LBJ’s Vietnam war policy. Daley, who regarded any protest as a blot on his city’s honor, ordered his police to use massive force to crush any demonstrations that threatened the Democratic convention, or public order generally, and called in the National Guard to help. He had crushed the riots after Martin Luther King’s death. He would crush these, too. The result was a running street battle that lasted throughout the Democratic convention, and even sometimes spilled over into the convention hall. Perhaps 10,000 protesters confronted the police, day after day, night after night, trying to hold demonstrations while living on the streets and in the parks. And the police pushed back, with riot gear, clubs, and tear gas. 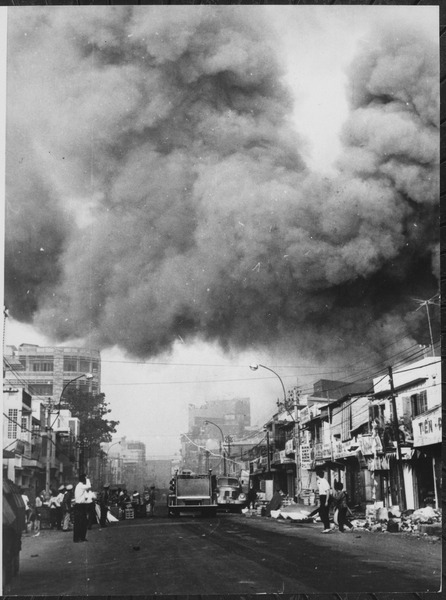 The conflict reached a climax on August 28, the day of the “police riot,” when so much tear gas was deployed, it even made its way into the hotel where Hubert Humphrey was showering. And it was all on television, shocking the American people. Although the majority of Americans supported the police against the demonstrators, the violence left a lasting legacy. The following year would see the radicals return to Chicago for the “Days of Rage,” and later that year the Chicago police would shoot down the city’s Black Panther leader. Chicago would continue to be plagued with political and racial violence for years to come. Nor did Hubert Humphrey do any better. Although he had won the nomination, the peace faction of the party never accepted him. The Southern conservatives went a step further and bolted the party to form a third party under George Wallace. Republican nominee Richard Nixon, running as a centrist claiming he had a secret plan to end the war, was the beneficiary of the split among Democrats, winning the election with only 43% of the popular vote. This entry was posted in History, Martha's Children and tagged 1968, Chicago, demonstrations, History, lyndon baines johnson, mayor richard daley, politics, riots. Bookmark the permalink. 1968 was the first time I followed the Presidential race closely, on TV and in the newspapers. My own understanding was fairly weak at the time. In retrospect, even if I’d been an adult, I’d have had trouble understanding what was going on. Developments in the black community and on the political side of the counterculture were invisible to the mainstream media until they intersected established political venues or erupted in violence. And in 1968 it was still the case that less than half the delegates were selected by primaries! Most were selected by state caucuses, in a secretive process dominated by each state’s leading politicians. There were developments going on that only became known or understood long after the fact. LBJ had heard from his doctors he might not live out another term. Nixon and his advisers decided on what became the “Southern Strategy” to capture the South for the GOP, which they ultimately succeeded in doing, making the GOP more conservative. The Democratic liberals would take over the party after 1968, leading to the McGovern candidacy in 1972. Both the black civil rights movements and political counterculture were fracturing, leading to the short-lived rise of the Black Panthers and the Weather Underground. I can add here another POV, coming from Tel Aviv, 2012. During Summer 2011 (nicknamed j14, because it started on July 14, the Bastille Day), Tel Aviv’s Rothchild Avenue (the main beautiful avenue of Tel Aviv), and many other streets and parks all over Israel were covered in tents, as a protest against the cost of living and the Neo-Liberal economy in general. Demonstrations took place all over Israel during that summer, the most remarkable one was the 400,000 demonstration on September 2, which took place in Tel Aviv, Jerusalem and Haifa. By November 2011 Mayor Hulday (a bad name for a mayor: it means originally “the man from Kibbutz Hulda”, but really sounds like “the rat man”) crushed the protest, using inspectors who evacuated all tents, sometimes forcefully, encouraging other mayors to do the same. In June 2012, when a few activist, including one of j14’s initiators, Daphne Leaf, tried to set up tents again, having realized nothing has changed despite the government’s promises. This time, all of them were forcefully evacuated and arrested. If I can find Daphne Leaf’s picture I’ll post it here. This act by Hulday, which was quietly supported by Meretz, the so-called social-democrat (the leftist party in his coalition that quit the coalition after massive pressure), lead to a series of demonstrations, one was held despite the Border Police’s attempt to crush it. I was there, in all these demonstrations (except for the setting up of tents in both 2011 and 2012). So when you tell me about a mayor crushing demonstrations, I say it doesn’t matter what is the reason, I know how it feels like. It is one of the most terrible, anti-democratic and, yes, Neo-Liberal acts that can be. Dana, thanks for the more contemporary perspective, and I’m sorry you had to go through that, to say nothing of what some of the other people, such as Leaf, had to go through. The problem with demonstrations is that they represent an implicit challenge to the popular basis most governments claim. Hence governments have a choice: concede the reality of the causes of the protest, and try to find a way to deal with them through normal political channels, or claim they are not legitimate, and try to disperse them on that basis. And, of course, since a crowd is by its nature disorderly, it’s easy to claim it is illegitimate, and almost as easy to provoke an incident if one isn’t ready to hand. So it’s not surprising that while protesters emphasize the political issues for which they have assembled, authorities that disapprove of that message will try to change the issue to the deportment and character of the protesters. The mainstream media coverage of the 1968 Chicago protests and of the 2011 Occupy protests here in the U.S. tended to focus on the idea that the protesters were somehow not proper citizens, and hence it was of little concern what their issues were or how the police dealt with them. 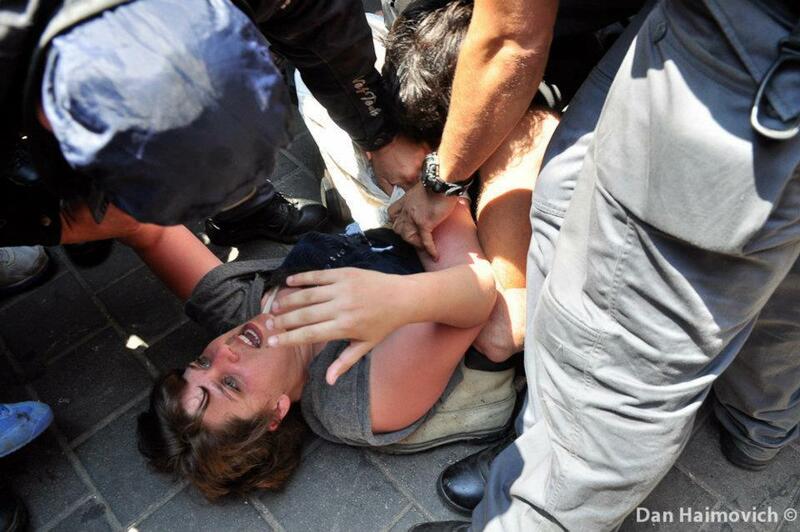 I would not be surprised if the media in Israel had done likewise with the protests you describe.